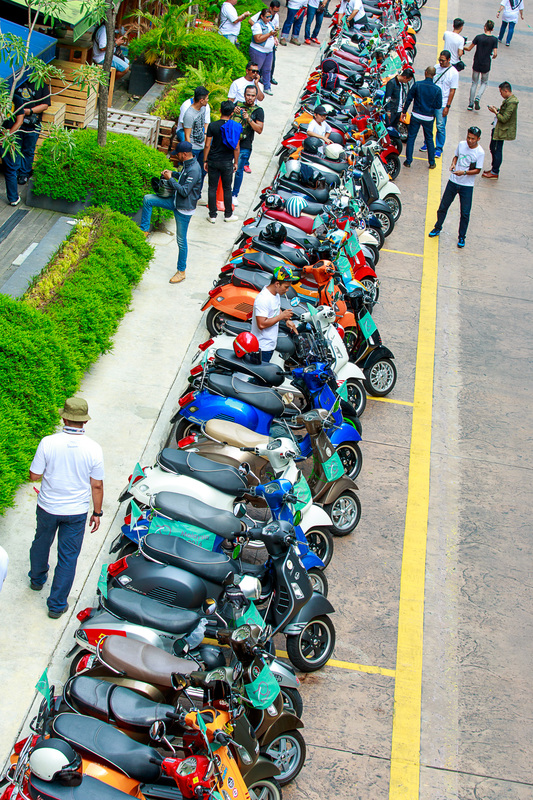 In conjunction with our Malaysian Vespa 70th Anniversary celebration, dubbed as “The Largest Vespa Gathering”, held at Publika Shopping Gallery on Saturday, 19th November 2016, Naza Premira Sdn Bhd, the sole importer and distributor of Vespa products in Malaysia, has put on display six new Vespa variants that are now on offer to the Malaysian public. The new variants include: three 70th Anniversary model (Vespa GTS, Vespa PX and Vespa Primavera); two newly upgraded 2016 models (Vespa Sprint ABS and Vespa Primavera ABS); and the recently introduced Vespa Sprint Adventure. 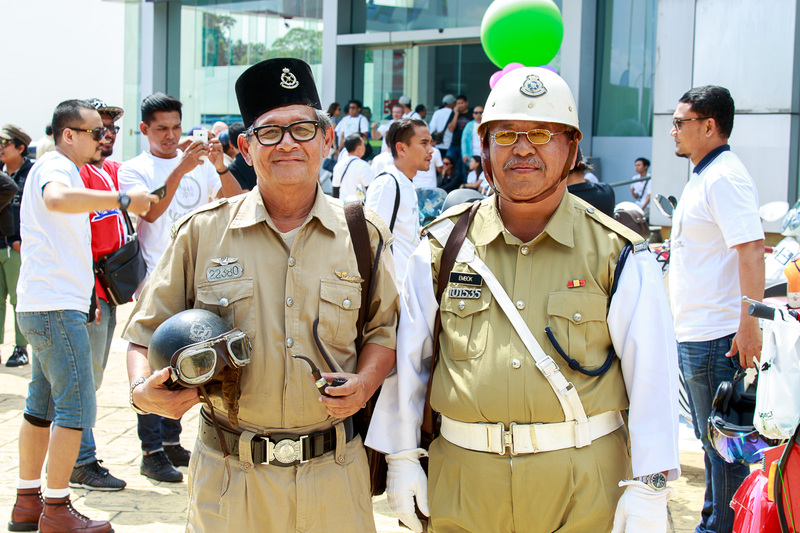 “Yes, Vespa is 70 years young this year, and we’ve come a long way since the company produced its first scooter, the Vespa 98, back in 1946” said Farouk Faisal, Chief Operating Officer of Naza Premira Sdn Bhd. “Our Heritage area summarises most of the important milestones and models that Vespa has achieved since then,” Farouk added. All three limited production-run 70th Anniversary models are finished in Azzurro 70th Anniversary colour and its seats upholstered in brown leather with the 70th Anniversary logo embossed on it. All three models are also garnished with chrome rear carrier and a custom-made 70th Anniversary brown leather carrying case that snugly fits at the back. “traveller” for excellence.The Vespa PX 70th Anniversary is powered by a 150cc, 2-stroke single-cylinder engine with both electric and kick-starter systems. It rides on a swing arm, spring coil and hydraulic monoshock absorber with disc brakes at the front and a spring coil with hydraulic monoshock absorber with drum brakes at the rear with 10-inch wheels. The Vespa PX 70th Anniversary has a nett selling price of RM26,000 without GST. It’s a sport and powerful scooter, a very representative of avant-garde in the Vespa family.he Vespa GTS 70th Anniversary is powered by a 154.8cc, single cylinder, 4-stroke, 3 valve, electronic injection engine that produces 11 kw at 9,750 rpm and 12 Nm of torque at 7,500 rpm. It rides on a single arm ESS (enhanced sliding suspension) with coil spring and hydraulic absorber at the front and a double hydraulic shock absorber with four-position spring pre-load adjustment at the rear with disc brakes and 12-inch wheels. The nett selling price without GST for the Vespa GTS 70th Anniversary is RM18,500. Launched in 1968, Primavera is the legend that move enter generations of young people, and that today continues to conquer them thanks to a new style of the future. The Vespa Primavera 70th Anniversary is powered by a 154.8cc, single cylinder, 4-stroke, 3 valve, electronic injection I-GET engine that produces 9.5 kw at 7,750 rpm and 12.8 Nm of torque at 6,500 rpm. It rides on a single arm with helical spring and single double-acting hydraulic shock absorber with ABS disc brakes at the front and a double-acting shock absorber, adjustable with four-position pre-loading with drum brakes at the rear and 12-inch wheels. 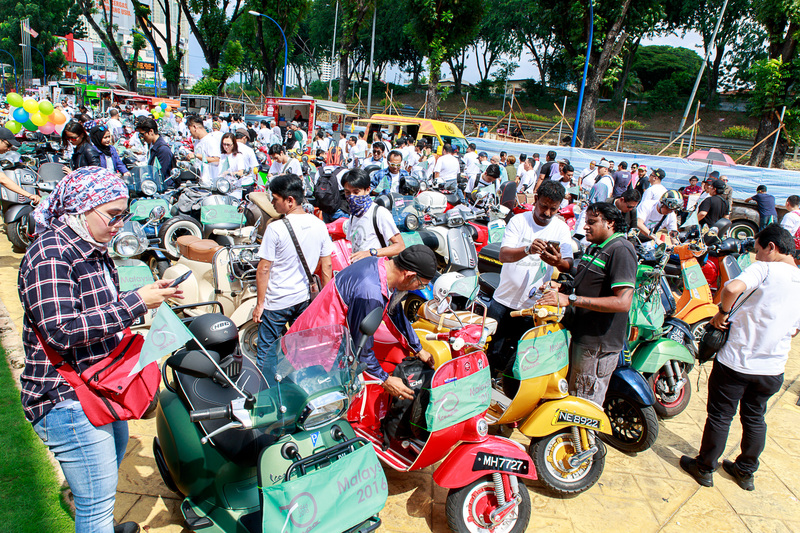 The Vespa Primavera 70th Anniversary carries a RM16,488 nett selling price without GST. The 2016 Vespa Primavera ABS is available in Five colours (Blu Midnight, Grigio Seta, Rosso Dragon, Montebianco and Nero Vulcano) and gets updated with an I-GET engine and an ABS system. The 2016 Vespa Primavera ABS is powered by a 154.8cc, single cylinder, 4-stroke, 3 valve, electronic injection I-GET engine that produces 9.5 kw at 7,750 rpm and 12.8 Nm of torque at 6,500 rpm. It rides on a single arm with helical spring and single double-acting hydraulic shock absorber with ABS disc brakes at the front and a double-acting shock absorber, adjustable with four-position pre-loading with drum brakes at the rear and 12-inch wheels. The 2016 Vespa Primavera ABS is offered at a nett selling price of RM14,888 without GST. Available in Seven colours (Blu Midnight, Grigio Titanio, Rosso Dragon, Montebianco, Arancio Taormina, Verde Muschio and Rosso Matt), the Vespa Sprint also gets updated with an I-GET engine and an ABS system for 2016. The 2016 Vespa Sprint ABS is powered by a 154.8cc, single cylinder, 4-stroke, 3 valve, electronic injection I-GET engine that produces 9.5 kw at 7,750 rpm and 12.8 Nm of torque at 6,500 rpm. It rides on a single arm with helical spring and single double-acting hydraulic shock absorber with ABS disc brakes at the front and a double-acting shock absorber, adjustable with four-position pre-loading with drum brakes at the rear and 12-inch wheels. The nett selling price without GST for the 2016 Vespa Sprint ABS is RM15,888. Recently introduced to the Malaysian public, the Vespa Sprint Adventure is only offered in Two colours (Matt Green and Matt Sand) and is garnished with both a front and rear black carrier and a smoked fly screen. The Vespa Sprint Adventure is powered by a 154.8cc, single cylinder, 4-stroke, 3 valve, electronic injection I-GET engine that produces 9.5 kw at 7,750 rpm and 12.8 Nm of torque at 6,500 rpm. It rides on a single arm with helical spring and single double-acting hydraulic shock absorber with ABS disc brakes at the front and a double-acting shock absorber, adjustable with four-position pre-loading with drum brakes at the rear and 12-inch wheels. 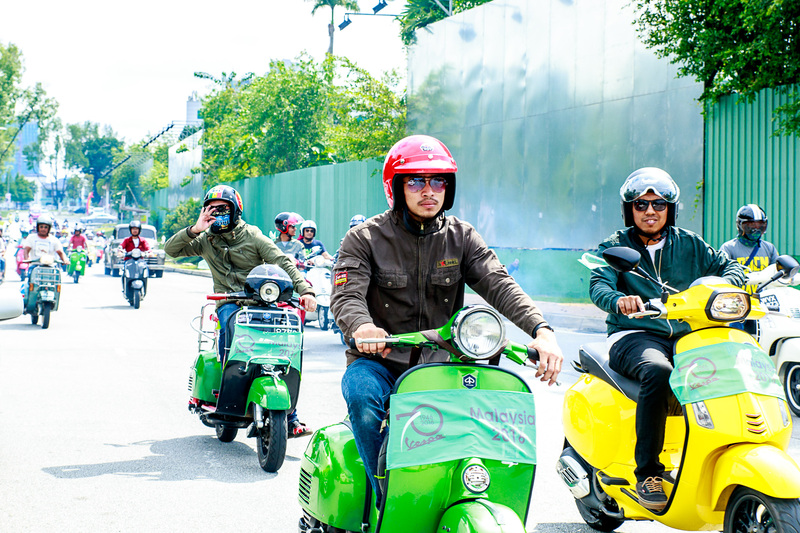 The Vespa Sprint Adventure is offered at RM17,000 nett selling price without GST.